Washington, DC — Sasha Bruce Youthwork Prevention, Outreach, Wellness, Education and Risk Reduction (P.O.W.E.R.) Program launches an HIV testing social media campaign — #Never2Early — that is specifically targeted to sexually active youth between the ages of 13 and 24 who have never been tested for HIV before. 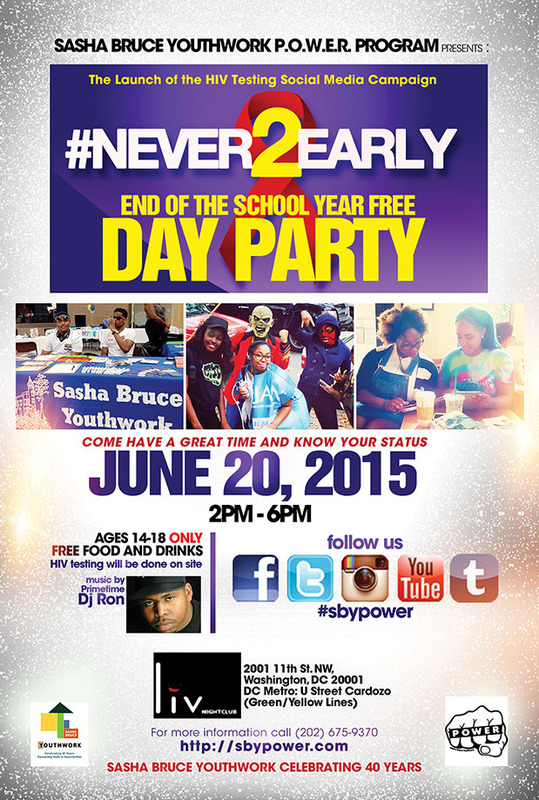 During the campaign, youth can visit Sasha Bruce Youthwork P.O.W.E.R. Program social media websites and get a wealth of information about testing locations in Washington, DC, and general information about sexually transmitted diseases, including HIV/AIDS. “The CDC reports that young people aged 13–24 make up 26% of new HIV infections each year, and over 50% of those youth are unaware that they are infected,” Omotunde “Tunde” Sowole-West, MPH, P.O.W.E.R. program director said. 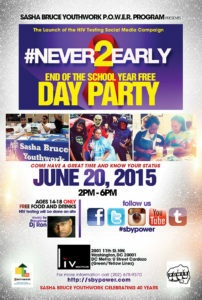 “With the #Never2Early campaign, the Sasha Bruce Youthwork P.O.W.E.R. program has the opportunity to put a significant dent in that number and thus improve the lives of the district’s youth simply by relaying the importance of getting tested,” West continued. “We wanted to highlight the strong influence social media has on shaping the views and opinions of the youth,” Jasmine Williams, P.O.W.E.R. Program HIV tester/counselor said. “That is why we included the hashtag symbol in the title of the campaign; it resonates with the popularity of social media and the frequent use of hashtags in posts on social media websites,” Williams added. To kick off the campaign, the P.O.W.E.R. program will host a day party for teens ages 14–18 on June 20 from 2 p.m.–6 p.m. at Liv Night Club, located at 2001 11th St. NW, Washington, DC 20001. During the party, youth will be encouraged to get tested for HIV. Sasha Bruce staff will be on site to provide testing for the virus using OraQuick, oral testing for the virus. Sasha Bruce Youthwork (SBY), a nonprofit organization started in 1974 by Deborah Shore is located in Washington, DC. SBY is the largest and most experienced provider of services to youth within the metropolitan area. For more information about Sasha Bruce Youthwork please visit www.sashabruce.org.